New Haven, Conn.—Charles Wright, hailed as one of the leading American poets of his generation, has been named the winner of Yale’s 2013 Bollingen Prize for American Poetry. Howe is the author of numerous books of poetry including “The Midnight,” “Souls of the Labadie Tract,” “The Europe of Trusts, Pierce-Arrow,” and “Singularities.” Her most recent book, “That This,” was awarded the Bollingen Prize in 2011. Among O’Brien’s many book titles are “The Fall of the House of Walworth,” “Sonata for Jukebox,” and “Dream Time: Chapters from the Sixties.” He has published six collections of poetry of which the most recent is “Early Autumn.” A book of his writings on film 2002–2012 will be published later this year. O’Brien is the editor-in-chief of the Library of America. Richardson is professor of English, comparative literature, and American studies at The Graduate Center, CUNY. Author of a two-volume biography of the poet Wallace Stevens, she co-edited, with Frank Kermode, “Wallace Stevens: Collected Poetry and Prose.” Her study “A Natural History of Pragmatism: The Fact of Feeling from Jonathan Edwards to Gertrude Stein” was published in 2007; her book “Pragmatism and American Experience” will be published later this year. From “Buffalo Yoga Coda I” by Charles Wright, in “Bye-and-Bye: Selected Late Poems,” Farrar Straus and Giroux, 2011. 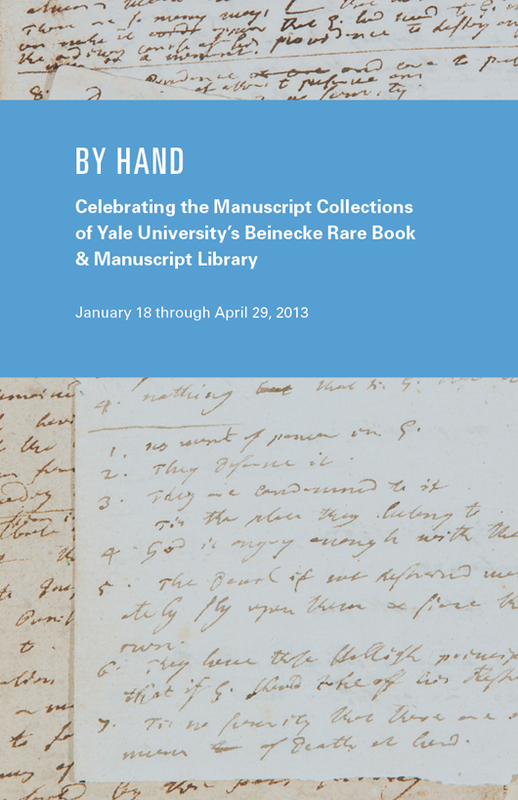 By Hand celebrates the fiftieth anniversary of Yale’s Beinecke Rare Book and Manuscript with an exploration of its manuscript collections. The exhibition begins where the Yale College Library collection of early manuscripts began, with a mirror of humanity, a copy of the Speculum humanae salvationis given by Elihu Yale. It ends with the manuscripts and drafts of “Miracle of the Black Leg,” a poem written by U.S. Poet Laureate Natasha Trethewey while she was a research fellow at the Beinecke Library in 2009. Manuscript, from the Latin term “by hand,” derives from the ablative case: locational, instrumental, situated always in relation to something or someone else. Like the term, this exhibition explores the reflections of humanity in the Beinecke’s manuscript collections, presenting them as markers of the social contracts of love, creativity, need, power, that bind us into historical record even as they bind us to one another. The exhibition ranges across the Beinecke Library manuscript collections, in an extraordinary display of the Library’s manuscript holdings, from papyri of the 2nd century A.D. through working drafts by contemporary poets, from manuscripts in the original Yale Library to recent additions to the collections. On view are manuscripts, notes, and proof copies of works by Langston Hughes, Rachel Carson, Edith Wharton, Zora Neale Hurston, Terry Tempest Williams, James Joyce, F. T. Marinetti, Goethe, and others; the Voynich Manuscript, the Vinland Map, the Lewis and Clark expedition map and journals, the Martellus map; the last paragraphs of Thoreau’s manuscript of Walden; letters, postcards, poetry, and notes by Ernest Hemingway, Gertrude Stein, Georgia O’Keeffe, Franz Kafka, Mark Twain, Erica Jong, and others; early manuscripts from a tenth-century Byzantine prayer roll, a fragment of lyric verse on papyri, the Rothschild Canticles, a fourteenth-century ivory writing tablet, and the first illuminated medieval manuscript known in a North American collection. The poet Charlotte Wilder (1898-1980) was one of three younger sisters of the novelist and playwright Thornton Wilder, and the oldest daughter in the prolific and literary family. Her poems appeared in magazines such as “Poetry”, “The Nation”, and “The North Georgia Review” in the 1930s, and she published two volumes of poetry, “Phases of the Moon” (1936) and “Mortal Sequence” (1939), both well received by critics. In 1941 she suffered a schizophrenic crisis and was hospitalized. She remained in institutions, with the exception of a brief period living in New York City during the early 1950s, for the rest of her life. Although her aspirations to continue as a professional writer remained, her writing career came to an end with the onset of mental illness. The life and work of Charlotte Wilder offers a striking case study for issues of authorship and gender in 1930s America. Her previously published but out of print volumes speak uniquely to the aesthetic imperatives and the milieu of modernism. She left behind approximately 200 unpublished poems that reflect her distinctive intellect and emotional landscape. She was at different times both brilliantly experimental and innovatively traditional in her practice, with a broad scope of expertise as a writer and an individual formal trajectory. She crafted poetry with subtlety and surprise. Completing her term as a Thornton Wilder Fellow in Wilder Studies, Caroline Maun will discuss the rewards and challenges of editing a proposed volume that collects Charlotte Wilder&rsquo;s published and unpublished verse. Caroline Maun is Associate Professor of English at Wayne State University in Detroit, MI. She is the editor of “The Collected Poems of Evelyn Scott” (National Poetry Foundation, 2005) and the author of “Mosaic of Fire: The Work of Lola Ridge, Evelyn Scott, Charlotte Wilder, and Kay Boyle” (Univ. of South Carolina Press, 2012). She has published one volume of poetry, “The Sleeping”, and her second volume titled “What Remains” is forthcoming in 2013. Caroline Maun is Associate Professor in the English Department at Wayne State University in Detroit, Michigan. She is the editor of The Collected Poems of Evelyn Scott (National Poetry Foundation) and Mosaic of Fire: The Work of Lola Ridge, Evelyn Scott, Charlotte Wilder, and Kay Boyle (University of South Carolina Press). She teaches twentieth-century American literature, creative nonfiction, and poetry. Caroline will be at the Beinecke through February 1. Martin Jean has announced the appointment of Christian Wiman to the faculty of the Yale Institute of Sacred Music as Senior Lecturer in Religion and Literature. The first five-year term of the joint appointment with Yale Divinity School begins July 1, 2013. Christian Wiman is the author, translator, or editor of seven books. His most recent book of poems, Every Riven Thing (FSG, 2010), won the Commonwealth Prize from the English Speaking Union and was a finalist for the Kingsley-Tufts Prize. It was named one of the ten best poetry books of the year by the New Yorker and by the National Post in Canada. His translations of Osip Mandelstam are collected in Stolen Air (Ecco, 2012); and a new book of non-fiction, My Bright Abyss: Meditation of a Modern Believer, will be published by Farrar, Straus and Giroux in the spring. Beyond his accomplishments as poet and essayist, Wiman’s perspective on the Christian theological tradition is profound. David J. Rothman (First Things) writes that Christian Wiman is “one of the preeminent devotional poets of any faith now writing in English.” Of Every Riven Thing, Dana Jennings (The New York Times) reports that it is an “ecstatic ruckus worthy of Gerard Manley Hopkins, who also tasted the tears in things—and the holy too.” He has been interviewed by Bill Moyers and Krista Tippett, and recently appeared on the PBS NewsHour. Wiman will join Prof. Peter Hawkins in teaching courses on subjects at the intersection of theology and literature, one of the cornerstones of the Institute’s interdisciplinary curriculum. Wiman’s extraordinary gifts as poet, teacher, critic, and editor will make him a natural partner in the musical, liturgical, and artistic life of the Institute, nurturing the formation of future preachers, theologians, and scholars in the Divinity School, and enhancing intellectual life throughout the Yale community.